Loving life in the Dark ! Hello Everyone ! Hope you are all well ! Rick and I are still loving the spring weather minus the muddy dog result but it is great to have the sun shining and the snow melting ! And not having to bundle up is GREAT ! I have been having a blast going into the city once to twice a week with my husband and just being dropped off at Tim Horton’s and going where I want and doing things that I want to do. We have been discussing weather to move back to the city so that I could have the independence and freedom that I really want, but we moved to a small town for our kids because this is the environment we wanted to raise our kids in so we have decided this is where we stay. I will continue to just go to the city when I want and need to with my husband and do the things I want while he is at work. This has been great ! I am very comfortable on the bus system in the city after not riding the bus there for about 8 years. I don’t think twice about grabbing a bus and going where I want. And with this has come a confidence I felt was a little lost. I was always so worried and unsure if I could do it and that isn’t there anymore. Rick has really helped with this because he has given me the kick in the pants to want to get out and do what I want. My experience in Portland when I went to get Rick also helped me with this. I was so nervous all the time when I went there, I had some major anxiety about travel and all travel. But after getting out and working in a huge city compared to where I am from with the amount of people and in a un familiar city. On the first few days I thought there is no way I am ever going to get through this and not only did I get over it, I had fun, I enjoyed it. It was challenging and I felt like I was free doing things that I was scared of. Things that shouldn’t be scary but were. Now I am living my life and loving it. I have struggled over the last year with my world getting darker. I had not been embracing my life in the dark I was angry with the darkness. But I am at a place now that I am enjoying my life in the dark and living it like I want to. This coming Tuesday is my first support group meeting that I am going to be facilitating and I am nervous but very excited for this new piece of my adventure. Spring is here or at least it feels like it is. The weather has been amazing the snow is melting the sun is shining. I really like the warmer weather but the downside of spring with a guide dog especially a yellow one is that he is a muddy mess every time we leave the house at this point. This means daily baths and I am sure he hates that more than the cold and I know I do. But on the upside it is much warmer out YAY ! Rick and I have been very very busy, getting out every day to walk and enjoy the sun. We have also mastered a few new routes in the city that we are able to do solo and I am loving it. We get to go up to the city about once a week some weeks more. And we are finding new things to do and we are loving it. Starbucks and Tim Hortons are our regular stops and Rick can find them like no ones business he loves coffee just like me! We are two peas in a pod. I have officially started a support group for seniors new to vision loss and have about 20 members, our first meeting is coming up next week and I am excited and very nervous. I have also been very involved in my toastmasters group and having so much fun doing it all. I finally feel like I am in the best place that I have been in the last year. I am enjoying what we are doing and the more I network and get out there the more I am hoping things will happen. 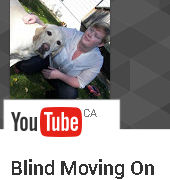 I am really liking the advocacy for the blind and the speaking that I have been doing. I am looking to try and get into some more speaking. And this is the path that I am hoping to pursue. So far it is working out really well and I am very happy with it ! Rick is doing great he is enjoying the weather and getting outside to play and to go for walks just because not that we are going anywhere specific. And most of all he is happy that our outings don’t include socks, boots, and a winter coat.